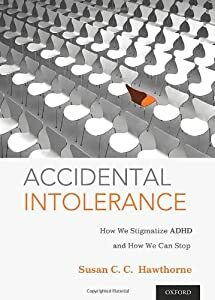 Susan C. Hawthorne is the author of Accidental Intolerance: How We Stigmatize ADHD and How We Can Stop, and is Assistant Professor, Department of Philosophy, St. Catherine University. In this article from the Oxford University Press blog, Hawthorne questions the current status quo around ADHD and the overuse of pharmaceutical interventions. Recently, over lunch with a fellow therapist (and like me, a person who in his youth did a fair amount of "reality adjustment"), we were discussing the ADHD issue. We both conclude that if you give ANYONE amphetamines that person will be more focused and get more done. Just because we give the drugs to kids who we think are doing poorly in school and they begin to do better does not even begin to mean they have/had ADHD - it means the amphetamines are working. And I now return you to the article at hand. In March 2013, we learned that 11% of US children and teens have received an ADHD diagnosis, an increase of 41% in 10 years. Diagnoses among adults have sharply increased as well. Some ADHD experts welcome this change. They interpret these high rates as signs that much-needed attention is finally being given to people whose biology has been a disadvantage in work, school, and relationships. Other professionals have been taken aback by the current diagnostic rate and its purported repercussions, citing risks such as overprescription of drugs, medicalization of normal behaviors, and drug diversion to street use. No general uproar has materialized, however. On the contrary, it’s looking like the upward trend will continue. Recent publications explain how to increase screening rates via computerized assessments, and how to hone diagnosis with a new EEG test. Most important, the new diagnostic guidelines in the American Psychiatric Association’s DSM-5 relax the diagnostic criteria, pulling more people, especially adolescents and adults, under the “ADHD” umbrella. The ADHD therapeutics market has responded enthusiastically, predicting high profits from increased diagnostic rates. One reason for the lack of outcry might be that people see this as the continuation of a steady trend: same old, same old. Diagnostic rates have been increasing for decades. Another might be the continued sway of the pharmaceutical business. It has effectively hyped the diagnosis for 40 years through targeted medical education; advertising to physicians, patients, and parents; and a smorgasbord of perks for “opinion leaders” and clinicians. I think, though, that the reason for accepting this status quo involves much more than the drug industry. Basically, a lot of people—and a lot of the social systems in which they participate—like the diagnosis. Teachers and education administrators like it: Within the strained education system, it addresses needs of overworked teachers and overcrowded classrooms. Physicians and medical insurers like it: It’s a win-win in the medical system because the diagnosis (in the predominant interpretation as a biological dysfunction in individuals) falls in physicians’ purview; current care is quick and easy, often consisting only of a prescription. Clinical scientists like it: Research dollars flow toward it because the diagnosis—hence the fruits of research—promises to solve problems. The first is that the continued reliance on ADHD as a research category puts clinical science in a rut—repeatedly studying ADHD and non-ADHD groups assumes that ADHD is a relevant and important category. More research should question that assumption. Investigating other hypotheses opens avenues of research that might better address clinical needs, as well as leading to more knowledge about mental health and illness. The second issue is the stigmatization of those who are diagnosed as having ADHD. Years of research has shown that ADHD diagnosis correlates with multiple life choices and outcomes generally considered negative, such as increased rates of accidents, substance abuse, poor relationships, low educational and work achievement, and higher medical and education expenses. Drawing attention to “ADHD” as a contributor to these life tracks puts the blame on supposed biological facts about the individuals. Then, despite efforts to spin attitudes toward compassion for these (putatively) inborn circumstances, the opposite often occurs. The correlation between ADHD diagnosis and negatively perceived life tracks instead provides a medically and scientifically justified target for social disapproval—that is, ADHD-diagnosed people are stereotyped and stigmatized. Alternatives suggest that the biological claims are at best incomplete, and that social circumstances require investigation and intervention as well. For these reasons, I think that it is time for new directions. More specifically, it is time to reassess clinical and research needs, and to find new ways to address both without relying on the “ADHD” catch-all. However, arguments pointing to evidence of progress via the current direction and arguments favoring the vested interests in the status quo—economic, educational, medical, scientific, and personal—weigh in the opposite direction. Should we change course? I welcome your ideas. Susan C. Hawthorne, author of Accidental Intolerance: How We Stigmatize ADHD and How We Can Stop, is Assistant Professor, Department of Philosophy, St. Catherine University. Image credit: Children in a classroom by Michael Anderson, National Cancer Institute. Public domain via Wikimedia Commons.